I was a feral stray who was caught and brought to a kill shelter. Lucky for me a human woman who volunteered there could not bear to let me be killed, so she paid to have me fixed and then let me go in the community where she lived, in North Brunswick New Jersey. One day I was exploring when I saw a bowl of food on a porch. What luck! Almost every time I came back to that porch there was a bowl of food for me! Then one day I saw a big grey and white cat with a rope around his neck sitting on the porch by the bowl. I slowly approached to see who he was and he greeted me and welcomed me to eat on with him on the porch. It turns out he was Hamlet, and we took to each other right off. In fact when other stray cats would come around and bully me, Hamlet would charge them to protect me. It was nice having a big 16 pound body guard! One day Hamlet was sitting on the other side of a big screen door by the porch. The screen was a open a little and I poked my head in to say hello to my friend. He invited me in to see his house but I was a bit apprehensive about going into a strange place, so I respectfully declined. Everyday he was there asking me to come in and visit and after a few weeks I decided to poke my head in before I ran off. Oddly the food bowl was no longer on the porch, but was just past the door on the inside. I ventured a foot in the door and carefully ate the food before thanking Hamlet and leaving. Eventually I ventured a bit further in the house. Then I saw a big human that Hamlet said was a friend, but I did not trust humans and I ran out. Each day I return the human was in the room. Eventually I tried to run past him to see the kitchen that Hamlet talked so much about. As I passed the human he jumped up and ran to the door. I tried to outrun him but he had too much of a head start and he closed the door. I spend a long time trying to run from him, but he finally caught me in a cage and took me to a vet to be checked out. The vet said I had worms and then gave me shots and pills. Yuck! I did not like being trapped in a house at the time, but looking back I see it was a good thing. I have a warm, safe place to live, a steady supply of food and water and a warm bed. I had yet to realize it at the time, but I had found the good life. It has been almost 6 years since that fateful day I found the bowl of food and my human friend David is now a real friend. He cares for me when I am sick (I get urinary tract infections a lot so have to eat Hill's Prescription C/D food), he pets me when I ask for it, he plays with me when I am bored and he even builds cat furniture for all of us to use. One of the things I like to do with him is to stand on my hind legs like he does and look over the kitchen counter as he makes my food. Sometimes I reach my paw up and manage to grab a piece to eat! In March of 2001 David brought home Leo. I did not like Leo much. David has been trying to make me accept Leo as a friend but I won't. For 2 years David took me to see a shrink and made me take some pills to help me accept Leo. He even keeps the entrance to the bedroom closed off with some kind of gates now, and Leo lives in there and I am forced to stay out of the bedroom. I don't think that is fair. I used to sleep on the bed in the day, hide under the covers when there was a thunderstorm and sit on the windowsill and watch the animals. At least David put a nice condo by the front window for me to sit in and watch the animals now, but I want my bed back! I will share this website with Leo, but I do not want to be his friend right now! In the fall of 2002 my tummy began to hurt a lot and I stopped eating. David took me to the doctor a whole bunch of times to have me looked at. They did a lot of blood tests and found I had Toxoplasmosis and IBD. I started to take medication for the Toxoplasmosis and new foods for the IBD but nothing was helping my tummy. More tests were done, including a bunch of things called barium GI series tests. We found out my duodenum (it connects my tummy to my intestine) was badly dilated and little could get through. I had to go into the hospital and have a section of my intestine removed. Then we found out even worse news, I have Lymphosarcoma (cancer) and it cannot be cured. We are not letting that get us down though. I now go for chemo ever week and we hope to slow the progression down for a while. In March 2003 I began to feel pretty bad again. My thyroids did not feel right to the doctor. I had to get a bunch of tests again. It turned out my thyroids were fine, but my glucose levels were over 480! Some of the chemo medications cuased me to get diabetes!. I had to get 2 shots a day for a while. My chemo protocol was changed and after 3 or 4 months the diabetes went away. The new medications caused me to lose all of my fur and whiskers. I did not like that. After 18 months from the begining my chemo ended and I was told I was in remission. A month after I began to get hungry a lot more. I went through a lot of testing again and found out the cancer was back. I was told the rescue protocol with chemo would likely not help and it would only serve to make me feel worse. So I decided to fight it myself, and I will continue to fight the cancer. After all I have a lot of things to live for, like Hamlet, David and spare ribs. On May 12th 2004 at 9:10am CDT Itchy left us. In the fall of 2002 Itchy became ill and could not eat solid food. He spent many days in the hospital getting x-rays, blood tests and several GI barium series. We found he had a stricture (thickened almost totally closed off area) in his duodenum (the section that connects the stomach to the intestinal tract), which had to be removed or Itchy could no longer get food past it and he would die. 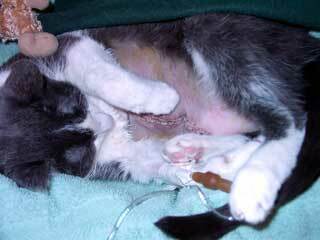 Of course we had it removed, which was a most invasive surgery, having to cut his whole belly open. A 2 to 3 inch section of his duodenum was removed and it with several biopsies taken. Itchy would take over 2 months to heal and recover from the surgery. The results of the biopsies came and the news was not good, Itchy had lymphosarcoma (type of cancer). The decision was made to start chemo as soon as he was recovered from the surgery and was started in November of 2002. Itchy went to the hospital each week for the chemo sessions and we had to give him several medications daily. The hope was to put him in remission. We encountered several problems along the way over the next year (diabetes) and finally in December 2003 we discontinued the chemo and Itchy was believed to be in full remission. Over the next 2 months all his fur and whiskers grew back and he began be his old self. In February Itchy began to have some rather odd colored stools and they were very large. As the vet and I tried to figure out if it was his IBD flaring up, his toxoplasmosis, or his diet, Itchy began to drink a lot more water. Diabetes (he developed it during chemo) or thyroids floated to the top of the list and more direct tests were made. Itchy began to eat a lot more food and lose weight be then, and by April had dropped from 12lbs to 8lbs. Blood work and his history were sent to specialists and after 10 days of careful diagnosis the consensus was that his cancer was back and was destroying his intestine's ability to get nutrients and water from his food. This was why Itchy was now drinking so much and eating so much. 4 cats worth of daily food intake was giving him almost nothing. He was eating wildly and slowly starving to death. The decision was made not to do a chemo rescue protocol, as the odds were low that it would even work and the cancer had already caused the loss of intestinal function that could not be recovered. We decided to start a new therapy called PolyMVA on April 30th. Itchy was continuing his decline, but fighting all the way. 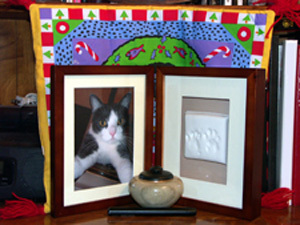 I had given Donna a paw print frame of Electra Christmas 2003, and I decided I wanted one for/of Itchy, so on May 3rd I went to the catalog where I first ordered the paw print frame, but they no longer carried it! They would not tell me who made them and we had thrown out the box in December! Realizing that Itchy's days were numbered I spent 2 days franticly trying to find the frames, but I did not even know the name of the frames at that point. On May 7th I found them at a fairly well known site and ordered one and paid for over night shipping, which ended up costing me more than the frame. It did not matter as I would have paid any amount to get the frame quickly. The frame came in on May 11th and that evening my Donna and I made the impressions of his paws. At 1:30am May 12th, less than 6 hours after we got his impressions he suddenly got a lot worse and lost the use of his back legs. He was trying to stand but would fall over and I was in tears and panicking. I stayed up with Itchy all night, telling him how much I love him and how special he is. When he needed to use the litter box I would pick him up and hold him over the box and he went. When he wanted water I would hold him over the fountain he used and he drank. I was crying my eyes out all night. The fight was ending and you could see the flame was leaving his eyes. It was the worst and hardest night of my life, yet I was praying it would never end since I knew what had to be done in the morning. We took him in his covered bed to the vet's and we spend a while with Itchy crying so hard it hurt. At 9:10am on May 12th, the doctor allowed my dear sweet Itchy to leave. Itchy turned his head towards me and looked right in my eyes and he was gone. (just telling the story has caused me to start crying, as it has been over 6 months) A large piece of my soul was ripped from me that cold and sad morning. You have touched my life more than you or I could ever imagine. You brought me laughs, you brought me tears, you brought me hope, you brought me pain. Itchy, you brought me life and love. I am unable to express with words just how deeply you touched my life, there seems to be a point where all logic and reason cease, and you entrenched yourself there, in my soul. I remember the first time I saw you, small, scared, but full of life. You decided Hamlet was your brother and you both became inseparable from then on. At first you did not trust me, or so I thought. I now know it was just a lesson in patience, with you my teacher. As I learned each lesson you taught me over the years, I never realized what you were doing. I now see that you did teach me and kept me heavily rewarded with things far more valuable than any monitory treasures. You gave me the rewards of your love, respect, trust and friendship, all the most wondrous and richest of gifts I would have ever hoped or wished for. Your teachings have come to an end and I know you must leave me soon. But how does one say good bye to all you have offered and shown me? You tell me I am ready, I can see it in your face, but I just cannot see it in myself. All I see now is the pain, sorrow and anger welling up, rushing to fill the void you will leave in my soul, the place you lived in my heart. I am and will drown in a sea of tears and sorrow, left with nothing I fear. My heart will hurt without you. My life will never be the same with the loss of you. I lose part of myself. My life will never be what it once was, for I will no longer have you. In loving memory of my sweet Itchy.